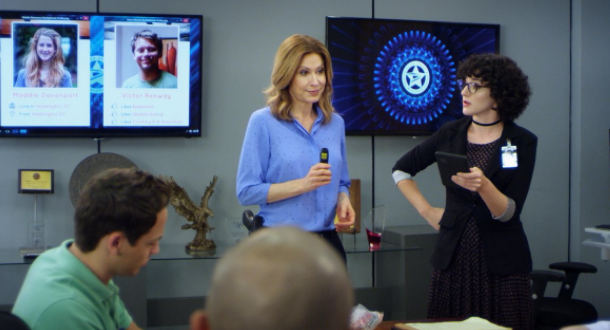 CBS The Inspectors episode titled “Mitch Knows Best” focused on Mitch trying to balance parental responsibilities with his career as a postal inspector with the two crossing when his latest case involves his niece Sam. 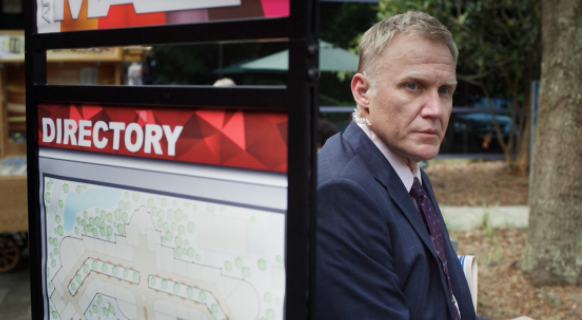 The episode opens with Mitch (Terry Serpico) on a stakeout at East Park Mall while Amanda (Jessica Lundy) and computer tech Margot (Tyner Rushing) keep surveillance in a nearby car. Two days earlier, we see Mitch at home. He is trying to interact with niece Sam, but she is busy on her phone having an online conversation. Mitch is still new to his parenting thing and wants to connect with Sam. He gives her a package she received and comments that he doesn’t recognize the name on the return address. When Mitch questions further, Sam angrily says that she doesn’t have to tell her uncle everything about her friends. At work, Amanda is meeting with Margot, Mitch and Preston (Bret Green) going over the details of their newest case: 14 year old teen Maddie Davenport has been communicating online with someone she believes to be a 15 year old boy. But the evidence points to it be a catfish predator Victor Renway trolling online for unsuspecting teenage girls. Her parents separation made Maddie vulnerable for attention making her easy prey for Renway. This teen predator arranges to meet the girls he’s pursuing at the mall, reasoning a large open spaced place is the perfect location to blend in without suspicion. He set up a meeting with Maddie but backed off when she wanted to bring her mother along. Margot tells Amanda that she will ask Georgia to see if prints can be lifted from a package Renway sent to Maddie to learn if those prints match any of the predators in the system. Amanda explains to Preston how these catfish predators set up a profile online to communication with the girls, start sending them presents like scarfs and hats. Then move onto cameras and ask them to take inappropriate pictures of themselves. They go so far as sending plane tickets so they can meet them in person without the excuse of the girls turning them down because they can afford to travel. Preston finds it hard to believe that the girls would go somewhere without telling their parents. Amanda reminds that when he was their age, he didn’t often tell her everything. Back at Mitch’s, Sam is online messaging a ‘VR’ and then leaves. Mitch returns home and calls out for Sam. He inadvertently turns the screen of Sam’s computer on with his foot. When he picks it off and panics when he reads the messages. Mitch leaves calls and sends a text to his niece, but when Sam doesn’t respond, drives off to find her. In the car, Mitch tries calling Sam again but gets her voicemail. He goes to the mall and finds her sitting at a bench. Mitch tells her how dangerous it is meeting with someone she talked with online. Sam is confused; she thought he wanted her to get to know Veronica (Erica Sanchez) better. So it turns out ‘VR’ stood for Veronica Ruiz and not Victor Renway. “I hope no one’s in trouble here,” Veronica says noticing the tension between Sam and Mitch. Sam storms off, no longer in the mood to go shopping for a dress for an upcoming dance. Later at home, Mitch tries to apologize to Sam but she’s still angry. She asks how he knew where she was and decided to follow her. Mitch answers that it wasn’t too hard to figure out she was at the mall. He admits he saw her computer, which isn’t password protected. How could he invade her privacy! Sam again storms off. Mitch realizes this parenting thing is difficult. The next day at work, he tells Amanda what happened with Sam. She shares a story about how she once followed Preston when he went to meet a girl he liked. Amanda assures Mitch that Sam will tell him anything really important. Margot tells Mitch and Amanda that fingers lifted from the package Maddie got match predator Jeff Guilford (Tommy Stewart) a.k.a Victor Renway. Margot was also able to get the IP address of the computer Guilford used to message the teen girls. Veronica tells Noah (Harrison Knight) and Preston what happened at the mall with Sam and Mitch. The guys are suspicious when she tells them about Sam’s new friend that she met online. Although Sam has never met him in person, Veronica comments that the guy seems nice and even sends her (Sam) presents. Meanwhile, we see Sam opening her package and taking out a red baseball cap. Margot contacts Mitch and Amanda that Guilford has a new target. We see that he’s been sending messages to Sam! This brings us to the opening up the episode. Mitch is at the East Park Mall on a stakeout for Guilford. A suspicious man is standing around looking at the teen girls. In the surveillance car, Margot identifies him as Guilford. Meanwhile, Veronica tries calling Sam while Preston texts Mitch that Sam is in danger. Mitch locates his niece wearing the red baseball cap. He gives her a hug; relieved that Sam is safe. He tells Sam to stay there. Guilford takes off running. Mitch chases him down but Amanda has already caught Guilford ordering him to get down on the ground. Sam witnesses the scene and Mitch assures she’s okay. At home later that night, Mitch tells Sam about the case with Jeff Guilford and how this wasn’t the first time he went after teenage girls. Mitch reminds Sam that the way to stay safe is to be smart about who she talks to online. CBS’ The Inspectors first new episode of 2018 hit the ground running with an excellent, entertaining and informative episode on the dangers of giving personal information online to people you don’t know.